We help you embrace technology into your lifestyle and business. Our goal is to make technology and simplicity come together where Technology Meets Simplicity! SimpTech Solutions is a 5 year old company that operates as a residential and light commercial electronics systems integration business to deliver simple, innovative technology solutions to many satisfied customers across the Northern Kentucky and Cincinnati, Ohio market. We deliver sound and video, multi media entertainment networks, security alarm protection and video surveillance, smart home, and senior care assistance technologies for both inside and outdoor environments. We have experience with many projects with existing homes as well as new construction build. We work to blend functionality with aesthetics and simple to use with performance of the overall solution regardless of the technology category. From traditional Home Theaters, Multi Room Music, and Security solutions to new generation Digital Media Sharing, Lighting Control, Energy Management, and Security Camera Monitoring solutions; SimpTech Solutions can provide entire system design, installation, training, and support covering a wide range of budgets and needs. Spectrum Sight & Sound is a custom integration firm specializing in audio and video distribution systems in both residential and commercial applications. Serving Metro Louisville and its surrounding counties, Spectrum Sight & Sound is the local solution for your audio and video needs. We are dedicated to providing the best in home and commercial electronics systems. Our broad selection of products gives us the ability to customize each project to fit our customer's needs. Dedicated to customer satisfaction, we will walk you through the design process as we develop the perfect system for you and your home. Welcome to RGB Home Theaters! Proudly servicing Louisville KY and the surrounding areas. 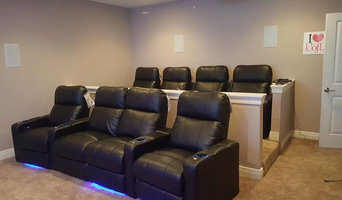 For custom and affordable home theaters, we are your one stop shop. Customer satisfaction is our guarantee. For fast, reliable and efficient service give us a call today. You won't be disappointed. Hawkeye Security and Electronics serves the Louisville-Metro area for all of your electronics needs including security systems and audio / video entertainment, including complete media rooms. All-Pro Satellite and Security is in the Satellite, Security, and Home Entertainment Business. We have been serving the Louisville Ky area for over 14 years. We have a highly trained staff that consists of sales, installation and service technicians. Automated Living provides superior electronic, automation, and integration services for all of our customer’s residential, commercial, and marine needs and desires. From simple home television installations, to installing complex pro audio/video/lighting systems for houses of worship; our knowledgeable and experienced professionals will work hard to ensure that our customers are completely satisfied. Haas Design Company provides Audio & Video Systems, Lighting Control Systems, Motorized Shading Solutions, Networking and Controls systems for residential and commercial projects. Are solutions are reliable, cost-effective and easy to use. With over 20 years in the professional media systems integration business, Haas Design Company has the knowledge, experience and resources to handle any size project. Visit our commercial or residential applications section to learn more about what we do. Our customers include broadcast, corporate and government clients along with residential clients looking for knowledgable sales and service in an increasingly complex digital world. Consultation, Sales and installation of residential and commercial entertainment and security system's. Hawkeye Security and electronics specializes on design of custom home audio/video and protection systems. Our technicians are direct employees rather than subcontractors; and we have a top-notch office staff for full service customer care. For over 7 years, Secure24, an independent Authorized ADT Dealer, has been keeping over 20,000 families safe and protected. This veteran owned business was founded in 2011 by The Tihen's. Growing from a small team of just 5 to over 70 employees responsible for selling, installing, and servicing home security systems. Secure24 is one of ADT’s largest independent installers in the United States! Secure24 offers ADT’s lowest pricing on monitoring and smart home solutions including infrared security cameras, thermostats, RING Doorbell, and many other security options. System Designs that suit your lifestyle! Audio Video Innovation is a small business that specializes in residential audio and video solutions. With over 45 years of sales and installation experience, our company can provide individual attention to our customer's needs. “KO” Towing stands for “KNOCKOUT” Towing. And that is our promise to you: whatever you need, we can knock it out for you! KO Towing is the only name you need to know for any kind of towing issue anywhere in greater metropolitan Louisville and beyond. KO Towing is the only affordable towing service you will ever need in Louisville and beyond! We\'d like to explain to you how and why a 24 hour towing service like KO Towing is the best towing company in Louisville. We are The Builder's Choice for Over 20 Years! Call us today and see how our one of a kind service can benefit you! 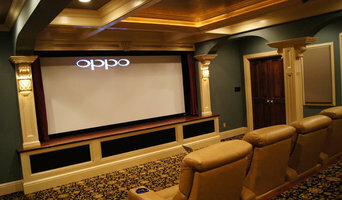 Home media specialists not only can design the seating and decor for your dream home theater, but most of them can help you find specific media control options, conceal your television and various accessories, set up optimal seating, choose and install ideal lighting, and help create the ultimate viewing environment. Some of these Kentucky professionals work entirely on their own, while others work with subcontractors to get the job done. Here are some related professionals and vendors to complement the work of home automation & home media: General Contractors, Interior Designers & Decorators, Paint & Wall Covering Dealers, Furniture & Accessories, Specialty Contractors. Find a home media designer on Houzz. Narrow your search in the Professionals section of the website to Crestwood, KY home media designers. You can also look through Crestwood, KY photos by style to find a room you like, then contact the professional who designed it.